Basil Rajapaksa, the younger brother of Sri Lanka's former President Mahinda Rajapaksa, has been arrested on corruption charges. He had served as a minister for economic development under his brother. He has been accused along with two other men of the "misappropriation" of state funds in a construction case. Mahinda Rajapaksa, who also faces corruption claims along with another brother, Gotabhaya, says he and his family are the victims of a witch hunt. His successor as president, Maithripala Sirisena, was elected in January on a pledge to fight corruption. 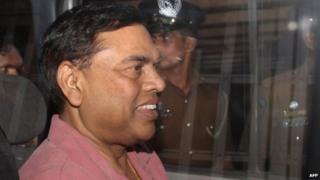 Basil Rajapaksa was brought before a magistrate in Colombo on Wednesday. His lawyer, UR deSilva, told the AFP news agency that his client had been interrogated for seven hours before his arrest. Mr deSilva said bail was not permitted for the offence. Basil Rajapaksa is being investigated over an alleged 70m rupee ($530,000; £353,000) fraud in a scheme for the construction of public housing, AFP reports. He holds dual Sri Lankan-US nationality and moved to the US after his brother's election defeat. He returned to Sri Lanka on Tuesday to answer a police summons. Another brother of the former president, former Defence Minister Gotabhaya Rajapaksa, has been accused of fraud in arms deals, and in the purchase of military and civilian aircraft. All three brothers have denied the charges against them. "They have no evidence. They are making wild allegations. This is a witch hunt," Mahinda Rajapaksa told AFP on Wednesday. "Neither I nor any member of my family has ill-gotten money."